Updated Thursday November 29, 2018 by BYB. 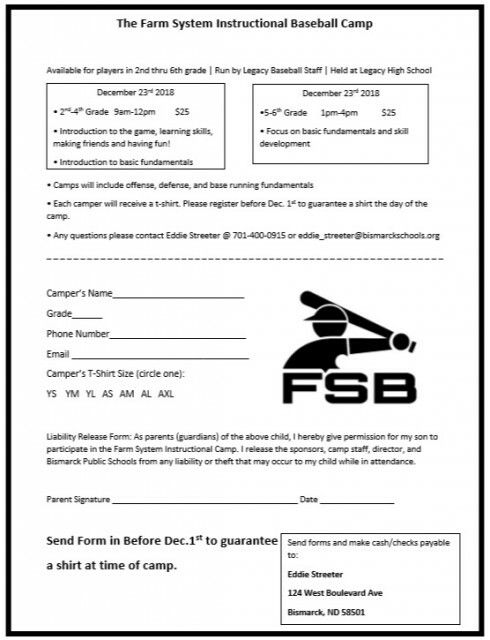 HOLIDAY BASEBALL CAMP!! On December 23rd, Legacy baseball coach Eddie Streeter is presenting two sessions of a Farm System Instructional Camp for 2nd - 6th Graders. There will be a morning session for 2nd-4th graders, and an afternoon session for 5th-6th graders. Both sessions will include offense, defense, and base running fundamentals. Please see attached flier for registration information.